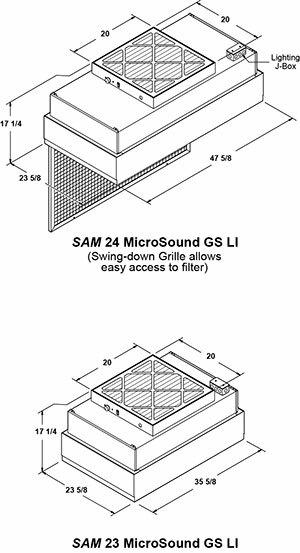 An acrylic eggcrate grille in an anodized aluminum frame is hinged to open, permitting removal of the filter without removing the unit from the ceiling. 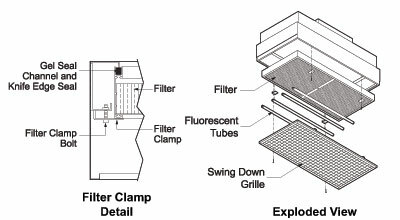 The integral light fixture and T8 electronic ballast is located inside the filter housing below the final HEPA filter. This permits fluorescent light bulbs or ballast to be replaced easily. 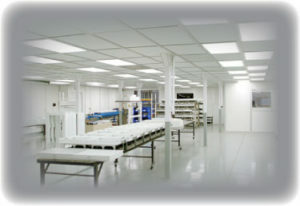 Lights are automatically on while fan motor is running. Other popular options include an 8’ power cord (110 Volt only), 99.9995% eff. ULPA grade final filter, UL 900 Class 1 filters and duct collar adapters. Refer to the back of this section for more options and accessories. Popular Options: Refer to next page for a list of popular options.